I celebrated my birthday this year with a Salted Caramel & Dark Chocolate Birthday Cake! Layers of dark chocolate ganache and homemade caramel alternate between each of the six layers. I celebrated my birthday this year with a Salted Caramel & Dark Chocolate Birthday Cake! Layers of dark chocolate ganache and homemade caramel alternate between each of the six layers of dark chocolate cake. 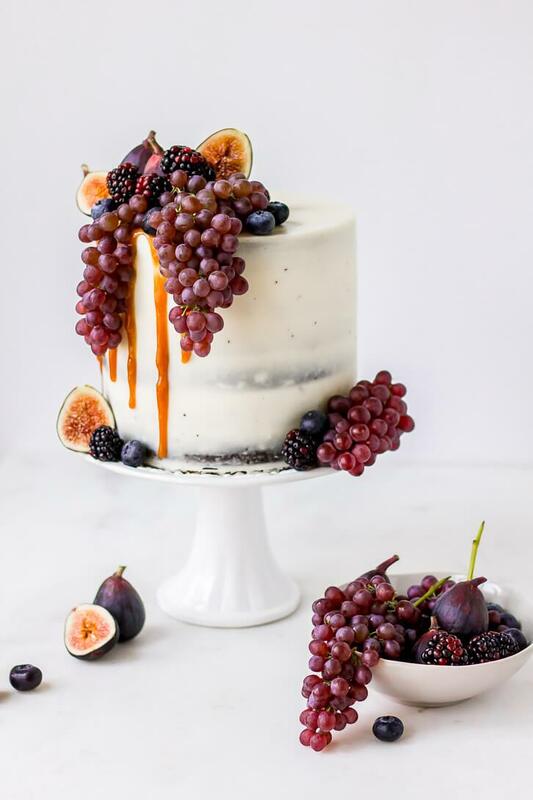 It’s finished with a vanilla bean Swiss meringue buttercream and decorated with champagne grapes, blackberries, blueberries, and fresh figs. Preheat oven to 350 degrees and prepare three 6" cake pans by lining the bottoms with parchment paper. Then, butter and flour the pans. In a large bowl, whisk together the flour, both sugars, cocoa powder, baking soda, and salt. Add the eggs, egg yolks, buttermilk, oil, and vanilla. Mix well with a spatula. Then, pour in the hot coffee and whisk just until combined. Divide the batter evenly between the three prepared pans and bake at 350 degrees for 45-50 minutes (or until a toothpick inserted into the center of each cake comes out with just a few moist crumbs attached). Let the cakes cool in the pans for 5-10 minutes, then turn each cake out onto a wire rack to cool completely. Place dark chocolate chips in a small, heatproof bowl. Heat the cream in a small saucepan over medium heat, just until bubbles begin to form at the edges. Remove from heat and immediately pour the cream on top of the chocolate chips. Cover the bowl and let stand for 5 minutes. Then, whisk until smooth. Set aside to allow the ganache to cool and thicken until it reaches a spreadable consistency. Over medium heat, melt the sugar in a small saucepan. Stir frequently with a wooden spoon until the granules have melted completely (they will begin to clump together, then melt into an amber-colored liquid). It's important that the sugar is completely liquified, so be patient! Reduce heat to low and add the cubed butter (the sugar may bubble and splatter when the butter is added, this is okay). Continuing stirring until the butter is melted and completely incorporated with the melted sugar. While continuing to stir the mixture, slowly pour in the heavy cream (the mixture may bubble and splatter again). Mix until incorporated, then increase heat to medium again. Allow caramel to boil for another minute or so, stirring occasionally. Remove the caramel from the heat and stir in the vanilla extract and salt. Pour into a heatproof jar or bowl to allow the caramel to cool and thicken. Add egg whites and granulated sugar to the top bowl of a double boiler (you can create one with your stand mixer bowl by placing it on top of a small saucepan with a little water in the bottom, but make sure the water doesn't reach the bottom of the mixing bowl). Whisk to combine, then turn on heat to medium. Whisking frequently, heat the mixture until the sugar has dissolved and the mixture feels smooth when rubbed between two fingers. Alternatively, you can use a candy thermometer to measure the temperature. It's done heating once the temperature has reached 160 degrees Fahrenheit. Using a stand mixer fitted with the whisk attachment, beat the mixture on high speed to form a meringue. Continue beating until stiff peaks form and the meringue has reached room temperature, about 8-10 minutes. Switch to the paddle attachment, then turn mixer to medium-low speed and add butter a couple tablespoons at a time, beating until incorporated. Add the vanilla extract and beat the buttercream on medium speed until it is completely smooth. 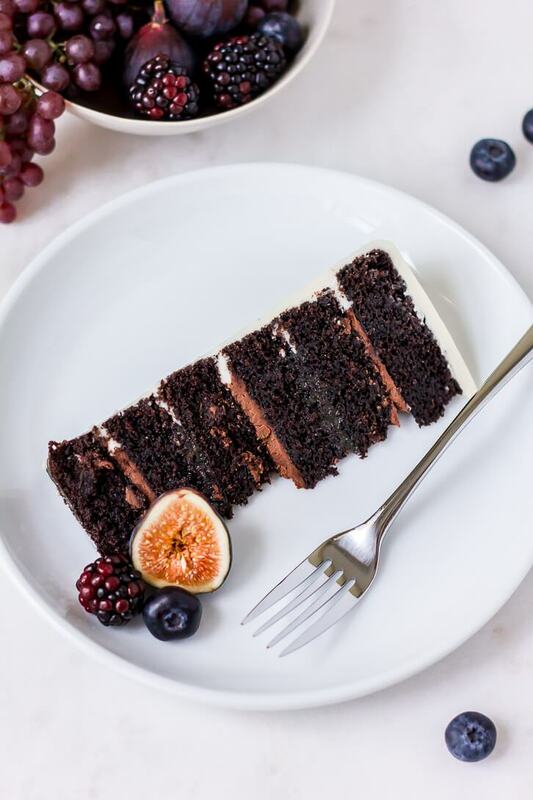 Use a cake leveler or a sharp, serrated knife to slice the rounded domes off the top of each cake, then to slice each cake in half horizontally. You will end up with six layers of cake. Spread a small amount of buttercream on a cardboard cake board, then place the bottom layer of cake on top. Use the buttercream to fill a pastry bag fitted with a large round piping tip and pipe a dam of buttercream in a circle along the edge of the first layer of cake (this will help prevent the filling from spilling out over the sides). Fill the center with 1/3 of the ganache, using an offset spatula to spread it evenly. Place the next layer of cake on top, pipe another dam of buttercream, and fill with salted caramel sauce, spreading it with an offset spatula or the back of a spoon. Repeat steps 3 and 4 with the remaining 4 layers of cake, alternating the ganache and caramel fillings. In the end, you will have 3 layers of ganache and 2 layers of caramel. For the last layer of cake, make sure to place it on top with the cut side facing down. Frost the top and sides of the cake with the remaining Swiss meringue buttercream, giving it a semi-naked finish. Then, chill the cake for at least 20 minutes. 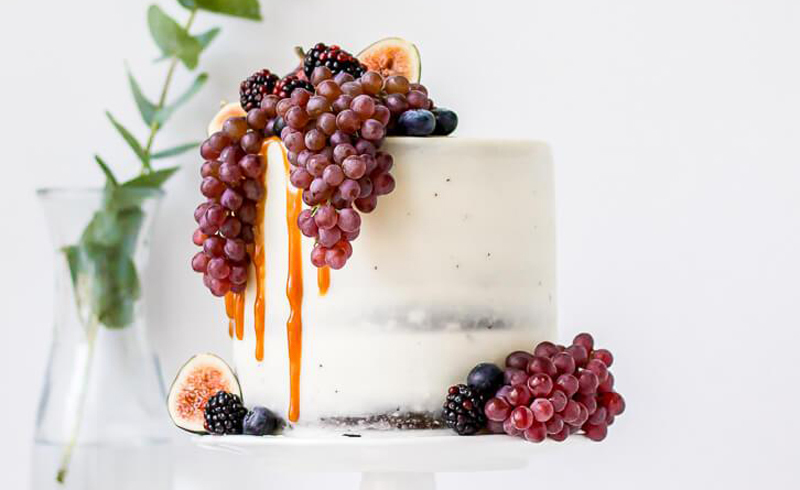 Once the cake is chilled, drizzle a little bit of salted caramel down the sides, then decorate as desired with figs, blackberries, blueberries, and grapes. If needed, you can use toothpicks to secure the fruit in place.